The 'Mean Girls' actress, who is starring in a documentary series that will air on the chat show queen's OWN channel early next year, reached out to assure Oprah that she had done nothing wrong after being accused by the hotel heir, who is Paris Hilton's younger brother, of ordering Ray LeMoine to attack him at a house party in Miami. A source told gossip website RadarOnline.com, "Oprah knows the truth about what happened and there are no problems between the two. 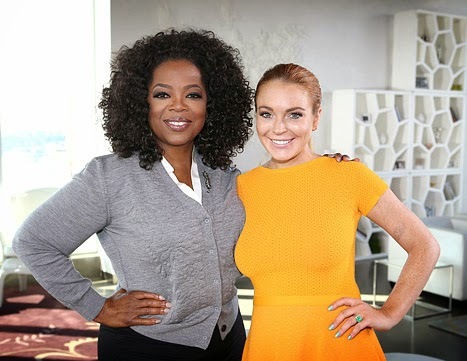 "Lindsay has tremendous respect for Oprah and she apologized to her for even having her name involved in incident." Ray, who has fled to Cuba, previously insisted Lindsay, 27, had nothing to do with the confrontation. He claimed he got into an altercation with Barron, who suffered lasting damage to his face, after the 24-year-old socialite refused to leave the house. He said, "My friend's name was on the lease of this mansion and we didn't want anyone to trash it, so we started kicking people out. "Eventually things got so heated that he (Barron) pushed me. And that's when the alleged assault, which of course I deny, took place."